Ever thought about working on being a genius? A Rochester Brainery genius, that is! 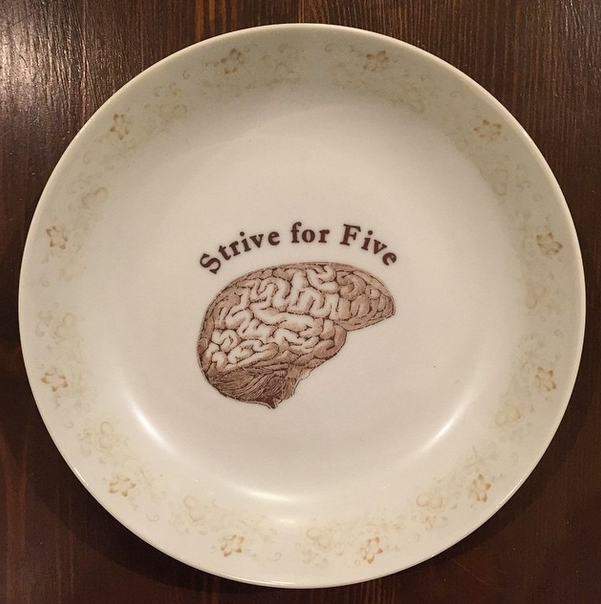 Here’s the scoop: It all started when we picked up an adorable brain plate from local artist Cat Clay (p.s. go visit her on the next First Friday in the Hungerford Building!) Above the brain it reads: “Strive For Five” and is proudly displayed on top of the desk in the Brainery lobby. The more we thought about the saying “Strive For Five” we developed an idea of our very own.... Now through the end of August you can participate in our “Become A Brainery Genius” summer challenge! When you come into the Brainery to take a class, you’ll be given a punch card (shown above) and we’ll stamp it with a little brain stamp. Keep the card handy and when you arrive at your registered class, you’ll receive another stamp. Once you take 5 classes ("Strive for Five"...get it! ), you’ll receive a FREE Brainery t-shirt on us! Wondering if there will be 5 classes you’re interested in taking this summer? Don’t worry; we’ve got you covered! We’re offering classes that range in everything from DIY to drawing and painting, food and drink, beauty, and even health and fitness. We even have a few classes that also function as fundraisers so you can donate to a cause, learn something new and work towards being a genius all at once (you multi-tasker, you!). Grab a friend or come on your own and take part in the “Become A Brainery Genius” summer challenge! I’m interested in joining for some class coming up soon.